Better care using whole organ dynamic CT protocols. 16 cm of dynamic volume coverage allowing the acquisition of anatomical and functional data within the same acquisition and with whole organ coverage. Lowering CT dose and improving workflow are not choices that clinicians should have to make, so Canon Medical Systems CT is putting customers first by providing the industry’s best solutions to solve these challenges. To make complex exams easier, lower dose and improve diagnostic accuracy and reproducibility, Canon Medical Systems is introducing its Adaptive Diagnostics CT technology. Dual Energy uses two energies during one CT scan, providing clinicians with more data to help quantify and characterize anatomy and lesions. As a result, exam times and radiation dose are both reduced. Taking advantage of the wide detector array of Aquillion ONE, 2 rotations are acquired at low and high kV, mA is automatically adjusted to maintain similar noise characteristics. Projections are matched with orbital synchronization and no table movement is required. The ability to acquire volumetric cardiac CTA within one heartbeat with no table movement required. If an arrhythmia or abnormal heartbeat is detected Aquilion ONE can automatically adjust the scan and acquire the next normal heartbeat. 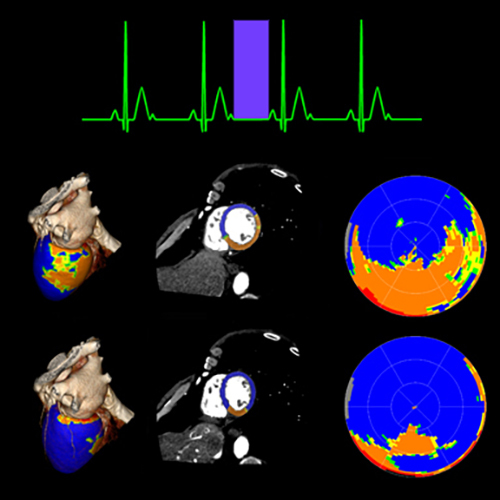 Acquires a Cardiac CTA with volumetric temporal resolution and contrast uniformity in ONE 0.275 sec rotation of the gantry and within ONE heartbeat. Overall faster scan times make vHP3 compliant to the needs of the patient, and shorten exam times for trauma imaging when every second is critical. A single series reconstruction enables several studies to be interpreted simultaneously for faster reading. AMC is an adaptive motion correction algorithm that enhances the visibility of the coronary segments with motion. Triage your chest pain patients in a single exam with anatomical and functional information. CT Myocardial Perfusion will allow visualization of non-reversible perfusion defects (hypo/hyper dense areas) in patients with angina or with a previous myocardial infarct. One exam with 50 cc's of contrast and 5 mSv of dose will acquire whole brain perfusion as well as a dynamic CTA with automatic bone subtraction. Entire study can be acquired in 60 seconds and with Vitrea's automatic processing, provides perfusion maps and CT DSA information ready to review in 4.5 minutes from anywhere in your network.